This cute 4-tube Airline has a nice bakelite cabinet and a small gold-colored dial. It was purchased at a VRPS meet in fair condition and needed little repair. 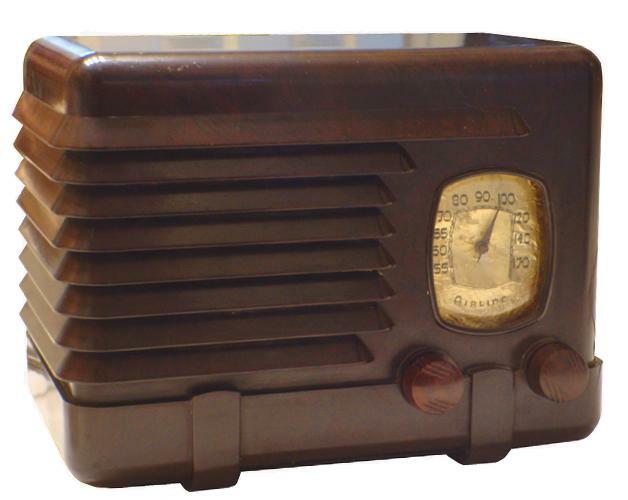 The radio still works with all of its original tubes, all of which are marked WARDS. Hidden behind the radio's charming appearance is a chassis directly connected to one side of the plug also known as a "hot chassis" and could be a dangerous shock hazard although the United Laboratories approval seal is on the chassis! The radio is a 4-tube superheterodyne with no IF amplifier stage and the same chassis is used for the Wells Gardner A11 series of radios including the Westinghouse WR150.